Photograph shows a view of Armstrong Point near Westgate in Cornish. Auditorium and Parliament Buildings, Winnipeg, Man. 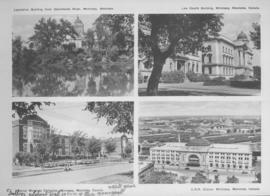 Photograph shows Winnipeg Auditorium and Parliament Buildings. Date of photograph is approximate, ca. 1940.